Serums are such an important step in our skincare routine and because I have combination skin, having a great purifying one is essential to keeping my complexion balanced, clear and smooth. Over the years I have used some pretty harsh ones (high alcohol content etc) that have left my skin irritated, dry and flaky but these three have been complete heroes for me. I wanted to do a post about them together because not everyone with acne or who is acne prone needs the same thing but between these serums there is an option for every skin type, acne level, ingredients preference and budget. This serum is easily my favourite of the bunch and for good reason. It’s a beautiful product packed with exceptional ingredients and of the highest quality. I first discovered it about a year ago and it was instant love for me. It has a light, fluid texture that absorbs easily, layers well with other products and smells incredible. I like to use this 3-4 times a week as a preventative treatment and it has been great at helping to keep my skin balanced and clear. You can use it AM or PM (or both), but I generally like to use it during the day because it’s oil control properties keep my skin from getting greasy glowy throughout the day. I do like to use it at night when I am having a mild breakout and recently used it both AM and PM to gently heal my skin from an ice cream induced breakout. I chose this method instead of going in with the stronger Bravura 2% Salicylic Acid Peel because my face was already quite dry from the extreme winter weather in NYC, so I didn’t want to make that worse and it worked perfectly. What I love about this serum is that it takes a unique mix of skin loving ingredients to do more than just fight blemishes, it also improves the overall health and appearance of the skin. It has >1% Willow Bark Extract to deeply exfoliate the pores, Zinc to heal the skin, Tea Tree to calm inflammation and Montmorillonite Clay to balance sebum. If you have combination/oily or acne prone skin then this serum will help balance oil production, increase the skin’s healing abilities, calm inflammation and fade the appearance of old acne marks leaving you with a clear, calm and balanced complexion. It also includes ingredients like Quinoa Seed Oil and Aloe Vera Juice which are hydrating and soothing, so it won’t dry you out or cause any irritation. The serum recently underwent an update and I am so excited about the addition of ingredients like Lilac Leaf Stem Cells (acne prevention and healing support) and Chapparal (ancient antibiotic and anti-inflammatory herbal aid) because not only are they great for the skin but it’s just so fascinating to me to see these types of unusual ingredients being used, which is exactly why Kypris is one of my all time favourite brands. They are creating innovative and conscientious holistic skincare and this serum is the perfect example of that. Previously featured in: 2015 Favourites, October Empties and September Favourites. My Bottle’s Ingredients: Active ingredient: salicylic acid 1% inactive ingredients: juices of pyrus malus (apple) juice,* citrus medica limonum (lemon) juice* & aloe barbadensis leaf juice,* saccharum officinarum,* salix alba (willow bark) extract, glycerin, botanical extracts of taraxacum officinale (dandelion) leaf,* melissa offficinalis (lemon balm) leaf,* salvia officinalis (sage) leaf* & camellia sinensis (green tea) leaf,* algae extract,* ubiquinone (coenzyme Q10), magnesium ascorbyl phosphate (vitamin C), tocopheryl acetate (vitamin E), retinyl palmitate (vitamin A), panthenol (vitamin B5), allantoin, phospholipids, sodium hydroxide, sclerotium gum, phenoxyethanol, benzyl alcohol, potassium sorbate, tetrasodium EDTA, xanthan gum, limonene, linalool, lavandula angustifolia & commiphora myrrha pure essential oils. * certified organic by a USDA approved agency. Current Formula Ingredients: Active Ingredient: salicylic acid 0.75%, Inactive Ingredients: Organic juices of vitis vinifera (organic white grape juice)*, pyrus malus (organic apple juice)*, aloe barbadensis (organic aloe juice)*, citrus medica limonum (organic lemon juice)*, vegetable glycerin, sclerotium gum, algin, salix alba (willow bark extract), allantoin, decyl glucoside, panthenol (Vitamin B5), magnesium ascorbyl phosphate (Vitamin C), tocopherol (Vitamin E), salvia officinalis (sage leaf oil), ubiquinone (CoQ10), saccharum officinarum (sugar cane juice), organic botanical extracts of camellia sinensis (organic white tea leaf extract)*, camellia oleifera (organic green tea extract)*, lavandula angustifolia (organic lavender extract)*, chamomilla recutita (organic chamomile extract)*, melissa officinalis (lemon balm leaf extract), algae extract, sodium benzoate, potassium sorbate, citric acid, lavandula angustifolia (lavender)* and Boswellia serrata (frankincense)* pure essential oils. * = Certified organic ingredient. I had been so curious about Juice Beauty for such a long time that when my sister permanently borrowed my current bottle of the Kypris Clearing Serum I figured I would use this opportunity to try something new, so I purchased this. It has a light, gel-like texture that feels cooling on the skin, absorbs easily and has a very faint fresh scent. I use it in the same way as the Clearing Serum – usually as part of my AM routine and as a preventative treatment. What interested me about this serum is the base of organic apple juice and organic aloe juice and the fact that it also contains ingredients like CoQ10, Marigold Flower Extract, Algae and Vitamin B5 to fight free radicals, hydrate and soothe, as well as provide antioxidant benefits, while the 0.75% Salicylic Acid fights blemishes. This would be an excellent option for those with mild breakouts or dry skin because it is so hydrating and won’t dry out your skin while you are healing your blemishes; or if you have combination skin and like me, and get quite dry during the winter. I think this would be great in the summer as a serum/moisturizer hybrid and I definitely intend on testing that out when the weather warms up. I think Juice Beauty are a great “nearly natural” brand and I have been so happy with everything I have tried so far. I love that they are creating such affordable and accessible natural/organic products and think it’s commendable that they are constantly updating their formulas in order to live up to their “Organic Solution” tag line. As you can see above there are two ingredients list – one is from the product I have and the other is from the current formula. I have highlighted the key changes and love that they have removed phenoxyethanol and tetrasodium EDTA but wish they had also removed potassium sorbate and not included sodium benzoate, just because these ingredients go against what their target audience want to see in the products they use. Previously featured in: January Favourites. This product should need no introduction by now, as it has been featured on my blog multiple times and in so many of my Instagram posts. I have done a full blog post on it here so I will just say that if you have acne or acne prone skin then I highly recommend this peel. It is amazing at keeping skin clear as well as refining the pores. What I love about this peel is how versatile it is, you can really customize how you use it depending on your skin’s needs – 3-4 times a week if you have severe acne or once or twice a week for mild breakouts. You can even use it just as a spot treatment if all you deal with is the occasional blemish. You can also use it as a peel for maintenance/prevention or as a serum to treat and heal active breakouts. Usually I apply it as a serum and then layer an oil on top to prevent any dryness but lately, because of the weather/travel my skin has been more dry than usual and I have been loving using it with my favourite African Botanics Intense Skin Repair Balm. This combo has been working so well and I just love the look and feel of my skin when I use these two together. This product really is a skin savior and even if you get either of the other serums, I would still recommend getting this one too because it’s that good. Previously featured in: 2015 Favourites, Holiday Gift Guide 1, Bravura London Review and October Favourites. Even though I love all three of these products, not all of them will be right for you. The Kypris Clearing Serum is definitely my favourite and I absolutely love the ingredients and the effect it has on my skin, but it costs the most and I completely understand that while it is well worth the price, it might be not affordable for everyone. On the other hand, the Juice Beauty Blemish Clearing Serum is excellent value for money and I love how hydrating it is although for me (and I am sure other green beauty lovers out there), some of the ingredients could be better. The Bravura 2% Salicylic Acid Peel is an absolute must have product for me and the price is unbeatable and although the ingredients are 100% synthetic, I fully believe it’s worth the compromise because the results speak for themselves. Next > February (new) Favourites and Announcement! So just to confirm; do you leave the Bravura peel on and put a oil or moisturizer on top? I bought this product and it says you should only leave it on for 5 minutes maximum!! sorry I am new to this beauty regime and it is a complete mind field…. This was helpful. Thank you! I am 35 and still suffer with minor breakouts. It gets pretty old. I have been to put together a routine that works after discovering Caroline Hiron’s blog this fall. I feel like this type of product is my missing link. Thanks again! So happy you found this helpful. 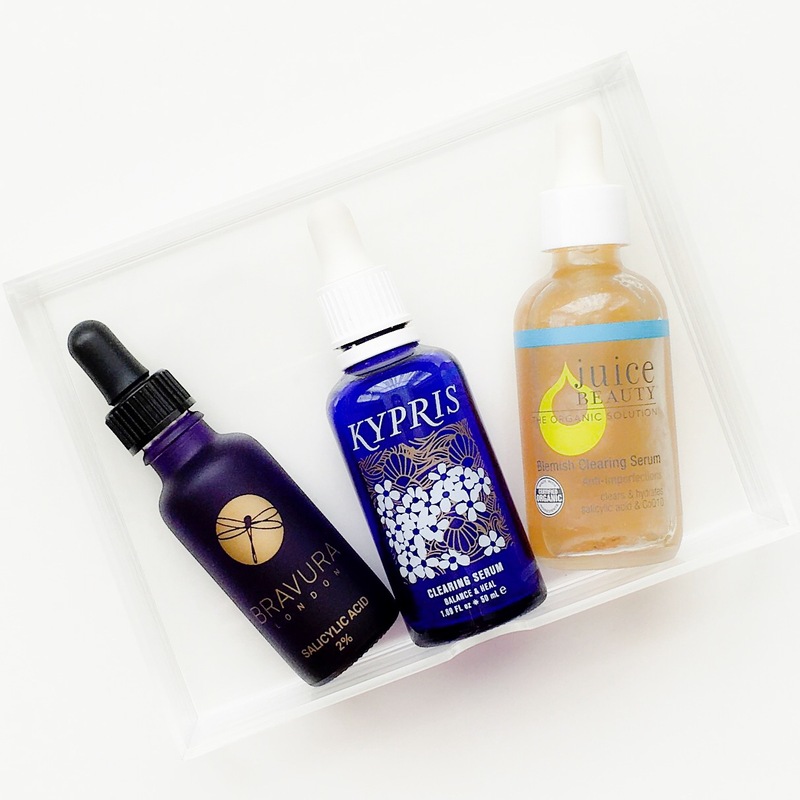 ☺️ Yes, if you are getting minor breakouts then a purifying serum is a great preventative treatment and you can’t beat the combo of Kypris (or Juice Beauty if you have very dry skin) and the Bravura at night. I have been internally debating between trying one of the Kypris or Vitners Daughters serum/oils next and I just can’t decide. At least I still have a few on the go at home now that I’d like to finish first, but damn, they both sound incredible. Lol!!! I know this struggle! 😩 Personally, I can’t recommend Kypris enough – the products are beautiful. Should be trying Vitner’s Daughter soon so I will let you know how it compares! I really wanna try out the kypris serum!! It sounds amazing 🙂 You did a great review and I will be buying this very soon hahha! I just bought the Kypris & tried it for the first time tonight. It made my skin tingle a lot for > an hour after application. Do you normally find this? I don’t normally have sensitive skin so was a little concerned & washed it off. I’d used Pixi glow tonic as an acid toner before – could it be that the combination is too much? Thanks for your help – your blog is so helpful & informative! I know this is an older post, but I just discovered your blog and find it very useful, so THANK YOU! I have been eyeing Bravura products for several weeks now and this post is really encouraging, I will likely purchase some today. I was hoping you could help me identify an affordable yet effective alternative to the African Botanics Intense Skin Repair Balm / Kate Somerville intense repair cream as they seem to have the same place in the routine: post treatment repair. I am mainly looking for a good post retinoid treatment as I have pretty noticeable reactions to it, but still experience the benefits, which I don’t want to lose. I currently use Ordinary “Buffet” and Pai “Regenrative Rosehip Oil” to soothe post treatment, but could use something a little more effective that contains non questionable ingredients. Your recommendation woul dbe greatly appreciative. Also , do you have a recommendation for a Plie dupe, as it is sold out and I don’t think it is going to be restocked until Grand Plie comes out later this year.